For those of you who don't know, earlier today Cyan released a never-before-seen photo of what I believe to be Channelwood. So what could this possibly mean? Well, in Rand's interview with the DMR he mentioned that they were working on a remake of realMYST for Windows and PC, so that's my guess on what that is. Anyway, let the speculation begin! Cool! Where did they release this picture? It looks great. I remember reading that Channelwood's day/night cycle did not make the original RealMyst release. There was a photo of it at night released years ago, but it was not this one. I've always said this, but I feel that the 2000s were a period where the technology had to catch up to what Cyan was making in still images in 1994-97. I feel like finally, realtime 3d has gotten to that point where photorealism is once again possible. EccentricOne wrote: Cool! Where did they release this picture? It looks great. The picure was posted on Facebook, Twitter and Google Plus that I saw, . . . . maybe other places too, that I missed?. . . I'm just going to post this here again - took the picture, scaled it up and made it brighter. Vector Cramp wrote: Anyway, let the speculation begin! Very well, I would hazard a guess that Cyan, besides working on RealMyst has another project in the pipeline that, based on the jobs section of their website, they are getting ready to hire people to work on. Since they are looking at resume's for modelers and programmers that are comfortable in Unity and the Unreal Engine, their next game will be based off those engines (I'm going to step further onto the branch and say Unreal). I'd also suggest that since there is probably few in house people that are comfortable working within these engines, before they begin production on "Something New" they are redoing RealMyst in-house based on the Unreal Engine in order for their in-house "permanent" staff to cut their teeth on it and see how the engine runs and what they'll need for "Something New". Similar to what they did with the original RealMyst and Plasma 1. They developed RealMyst to test the engine's capabilities, and teach themselves how to get into the nitty gritty of it all, before going onto Uru and rebuilding Plasma 1 for the needs of ABM. Congratulations, you just won the speculation game. Here's your complimentary killer whale photograph. I speculate that this is a for fun picture released because it was laying about and is pretty and has no bearing on current development in cyan HQ . The fact that Cyan has totally redesigned their company site, and has opened it up to fan participation is pure coincidence. Why is cyan interested in the unreal engine? Well I'm too so there! Also I think they are fiery abyss bent on making stoneship a success by maing it a 3D game and that is why there those peaople are hred, and also why there are no new bug chucker puzzles. HOW LONG WILL I HAVE TO WAIT! btw! I should get the prize. because I allways should! I quite like the picture though, and thank you for posting. Rudolfson wrote: I speculate that this is a for fun picture released because it was laying about and is pretty and has no bearing on current development in cyan HQ . The fact that Cyan has totally redesigned their company site, and has opened it up to fan participation is pure coincidence. Yet Rand has already confirmed that a remake of realMYST is in the works and will be Cyan's next release. What I'm hoping they do this time around is bring a bit of classic flavor into the game. Now, I'm not saying to completely change the designs back to look like Original!Myst, it's just maybe some comebacks of those design concepts might bring out a positive nostalgia factor in those who played the original. Yeah I agree, that was pretty cool. And when at the very start of the tunnel you were going so fast it was just like a crazy flashy thing, that was more fun that the minecart style (though I have to say the rest of the selenitic ride was more fun than the original). Vector Cramp wrote: Yet Rand has already confirmed that a remake of realMYST is in the works and will be Cyan's next release. Is it possible that this is the PC/Mac conversion of the iOS version? Since it's Unity-based and Unity is available for all those platforms. A bunch of the conversion work has been done already for the mobile, so maybe it's not as big a leap from that version back to the desktop. I doubt it. The image Cyan has posted is too detailed. There's more detail, such as extra plants next to the trees. 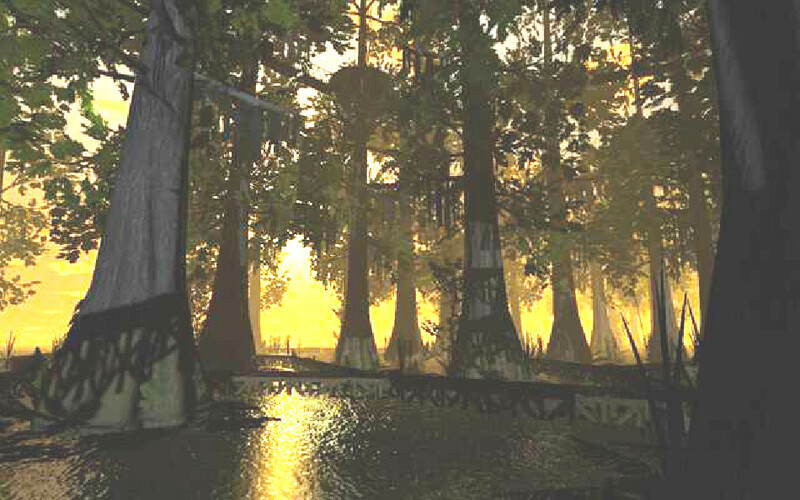 Apparently this is supposed to be a swamp-like version of Channelwood. The iPad version is missing many of the details, and looks rather bland. Also, for those of you thinking that the built-in shadow textures are wrong, there's a possibility that there's a moon off-screen reflecting light onto the scene.